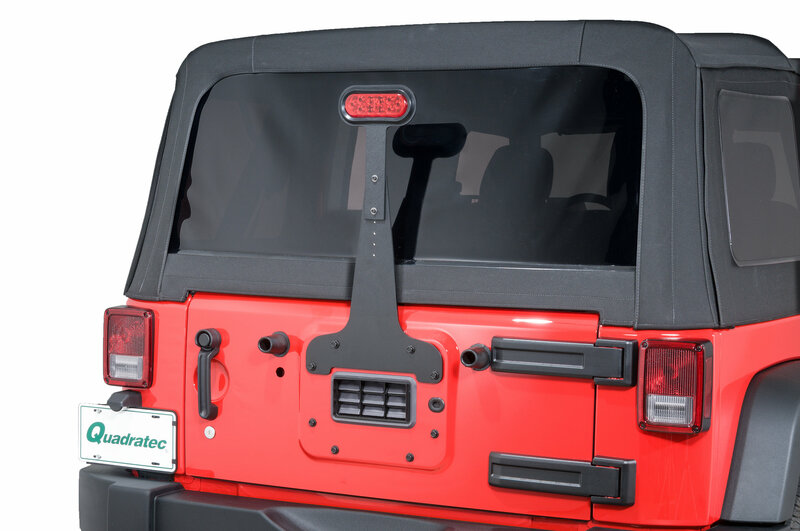 When Jeep® owners remove the wheel & tire off of the tailgate and install a swing-out tire carrier, they lose their 3rd brake light and the OEM bracket. This Welcome Distributing product remedies that issue, allowing you to stay legal and safe. 1. Cutting and Splicing of wiring is necessary. Perfect fit behind my 35in spare tire! Easy install. Mounted this on a 2006 TJ due to recent laws requiring a 3rd brake light. With this setup, you can kiss your rear windshield wiper goodbye if you have a hard top 2006. The wiper runs right into the 3rd brake light arm and hangs up as the arm is right up against the rear window glass at the bottom. When the tailgate is closed, the brake light bracket actually puts pressure on the rear window slightly. Glad I secured the wiring with clamps or the wiper might have torn the wiring up. There needs to be some sort of spacer between this product and the tailgate mounting area for 2006's. Adjustable and sturdy. Worth the price.